Until this report, there has not been an analysis of the real estate agents and the appraisers in Louisiana. This report provides a snapshot of both industries and examines who is number one and where they do business. How Many Real Estate Agents Are There? There are 13,438 licensed real estate agents in Louisiana, but where they are located will surprise you. The location of real estate agents does not match up identically with the location of the home buying public. For example, New Orleans has the most licensed agents but does not have the highest population count unless you add in Metairie. Shreveport is the 3rd largest agent count in the state but has the 5th highest agent count. The table below compares the ranking of agent count to population. 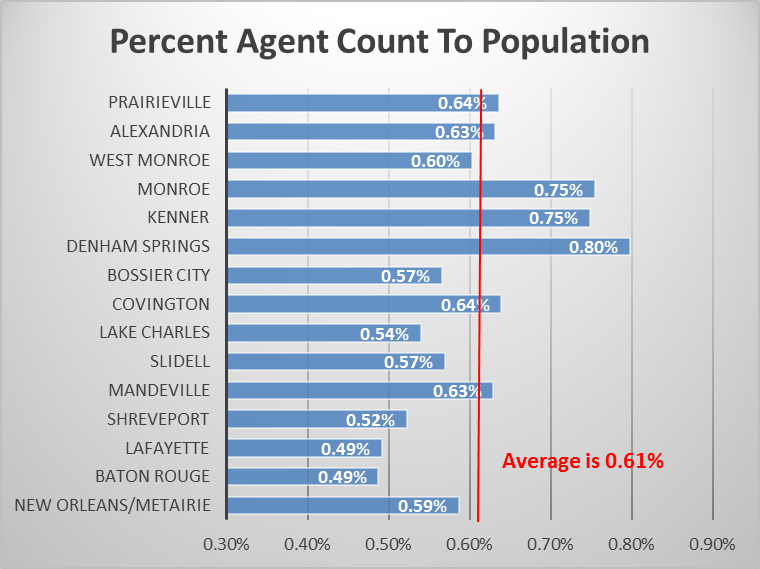 Ranking Louisiana cities by the ratio of real estate agent count to population shows that Baton Rouge and Lafayette have the lowest agent count ratios while Denham Springs, Kenner and Monroe have the highest ratios. Agents must have their license held by a broker, as required by the Louisiana Real Estate Commission. The broker is held to a higher standard and requires 150 hours of classroom education in order to become licensed. There are 10,589 licensed brokers in Louisiana, located near the agent population, with New Orleans and Baton Rouge at 19% of the market. The top broker in the state is Latter and Blum with 1,163 agents, but they only have 8.6% of the market. Who Is The Number One Broker In Louisiana? The broker market is not only fragmented but localized, with differences in agent count within areas just a few miles apart, as shown in the table below which compares the agent count by broker for New Orleans and Metairie. Who Are The Top 10 Brokers In The Biggest Market In Louisiana? In the Metairie and New Orleans area combined, the top broker is actually GBS Properties, known as Gardner Realtors with 318 agents, compared to Latter and Blum with 277 agents. *Appraiser Trainees receive a license upon passing a test and completing 75 hours of training. *Residential Appraisers receive a license upon passing a test and completing 3500 hours of training in no less than 2 years. *General Appraisers receive a license upon passing a test and completing 5000 hours of training in no less than 3 years. Of the 494 Louisiana General Appraiser Licensees, 265 (53%) are in Louisiana, 18 are in Mississippi, and 43% are in 22 other states. Texas has 126, or 25% of the Louisiana General Appraiser Licensees, with 55 (43%) in Houston and 27 (21%) in Dallas. The Residential License count tells a different story. Of the 752 Residential Licensees, 93% are in Louisiana, and 97% are in Louisiana and Mississippi, with the remainder in 9 states. Where Are The Appraisers In Louisiana? Metairie and New Orleans are home to 99 Residential Licensed Appraisers (14% of the state total), with Baton Rouge the 2nd largest market at 68 (9.7%) and Shreveport in 3rrd place at 43 (6.1%). General Licensed appraisers are mostly in the New Orleans/Metairie area with 53 (20% of the state total), followed closely by Baton Rouge at 47 (17.7%), with Lafayette in 3rd with 17 then Shreveport with 15. Where Are The Appraiser Trainees? There are several trainees with more than one supervisor, so the number of actual trainees is 191. There are 17 (8.9%) trainees with no supervisor, which means they cannot complete their training and earn their license. Over half of the trainees have not earned their license in the three year minimum time frame, with 40% licensed as trainees longer than 5 years, 22% longer than 7 years and 15% longer than 8 years. 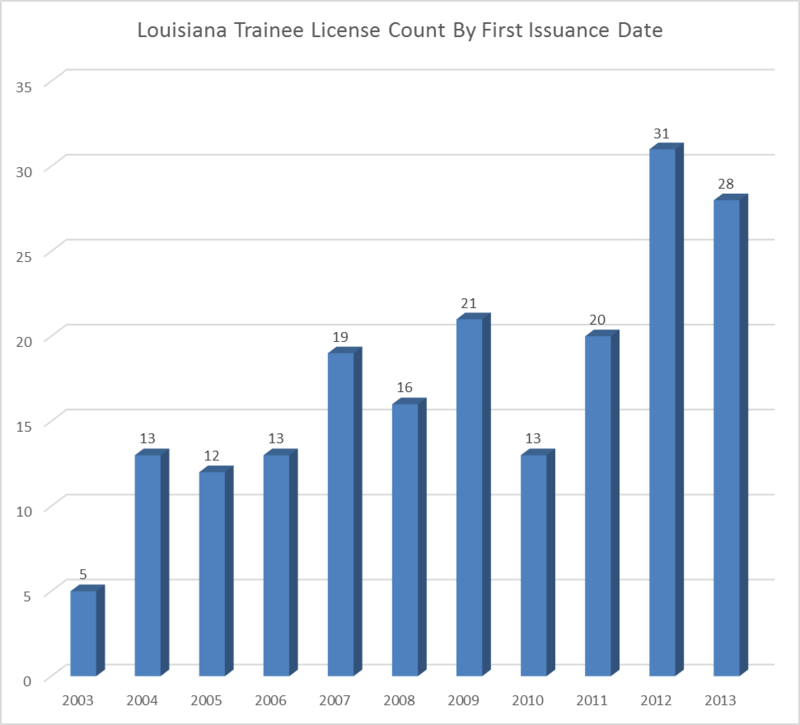 The inability of Licensed Trainees to graduate to a Residential or General License stems from a low percentage of appraisers in Louisiana who utilize trainees to grow their practice. A recent study by the Appraisal Institute shows that on average, 49% of General Licensed Appraisers who perform commercial appraisals and 29% of Residential Licensed Appraisers utilize a full-time Licensed Appraiser Trainee in their practice. 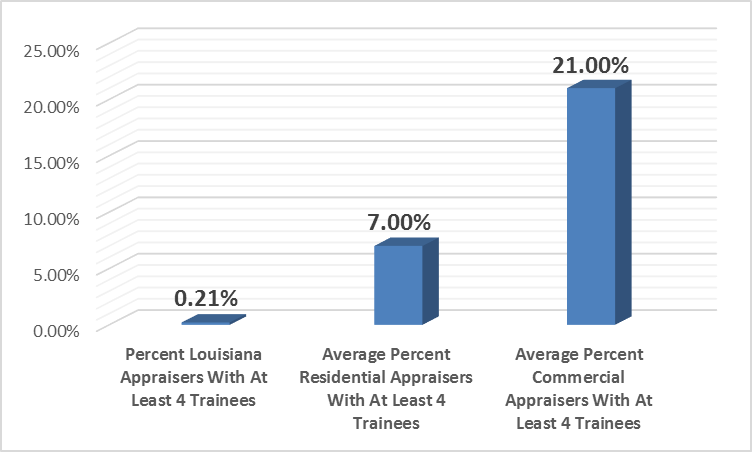 The percent of Louisiana Residential or General Appraisers who use a Licensed Appraiser Trainee is only 15%. The study by the Appraisal Institute in June 2013, showed that 21% of commercial appraisers and 7% of residential appraisers utilized 4 or more trainees in their practice. Of the residential appraisers who utilized trainees, 93% employed 1 to 3 appraisers. 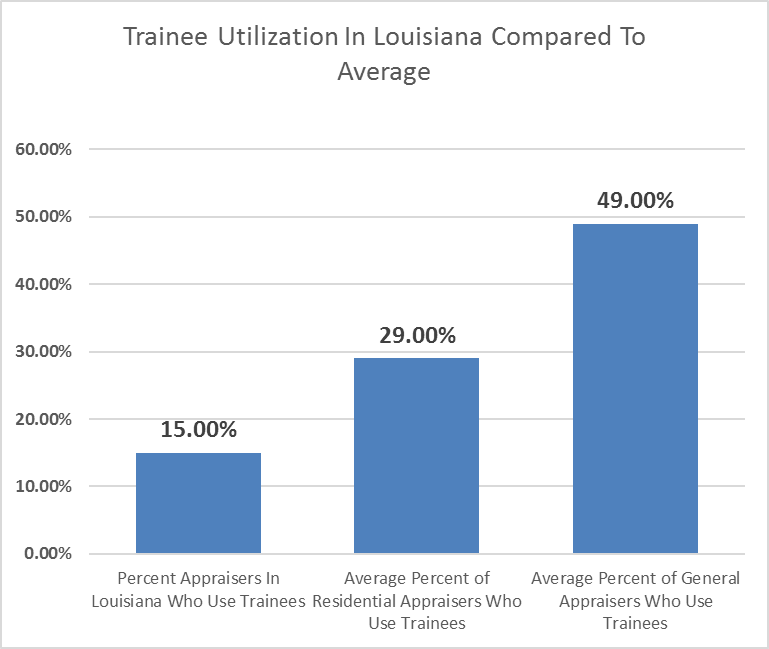 In Louisiana, only two of the 966 appraisers in the state utilized 4 or more trainees, resulting in a comparison percentage of 0.21%. Appraisal Institute, June 28, 2013, study by Appraisal Institute Research Department.